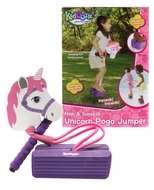 Magical unicorn pogo jumper is great indoors or out. Stretchy bungee fits any height and sturdy foam supports up to 250 pounds. Squeaks with every hop. Fun for adults, too.